I was very pleased when I was asked to announce the winner of this year's Ewen Stewart Inspiration Award. This award doesn't celebrate the fastest times or the most improved runner; rather, it celebrates and honours a club member who presents spirit, determination, guts, grit, and who inspires us all to be the best we can be. Alex graduated from Bluefield High School in 2005 and won prizes for the highest marks in two of his courses and as well as an application prize. As a runner, Alex was on the school Cross Country and Track and Field Team for three years. 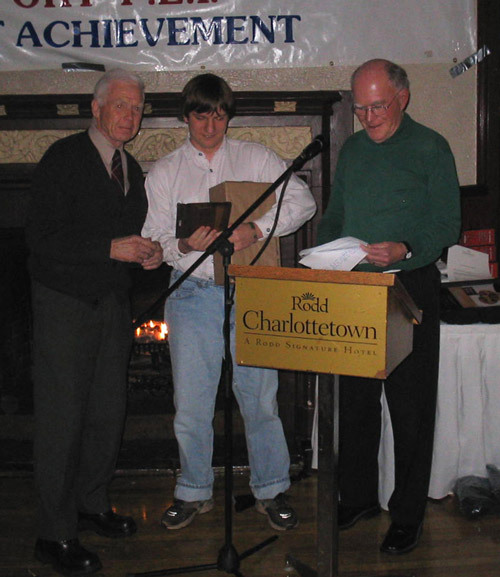 In 2004, he won the Award of Distinction for boys' cross country and another for top junior. 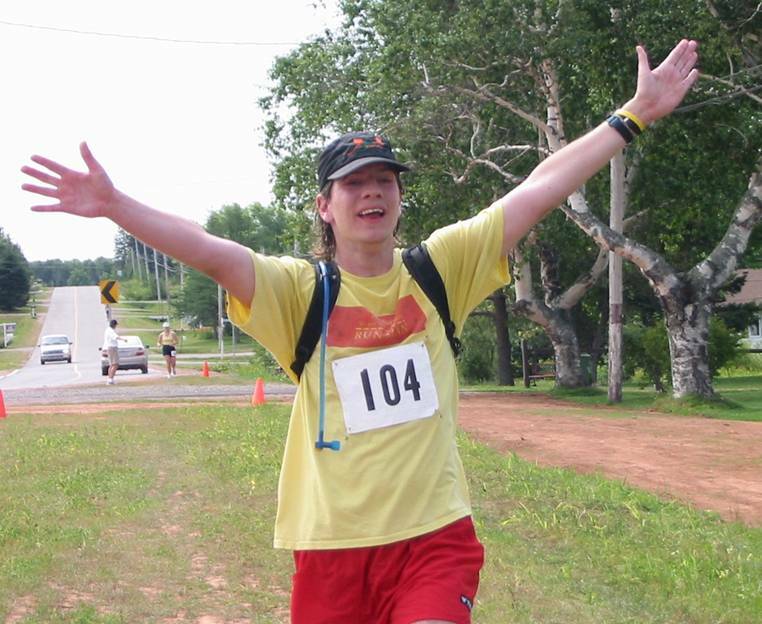 Alex has also competed in a number of PEI Roadrunner races. In 2004, he placed 27th out of a field of over 400 runners in the half marathon and was named Rookie of the Year at the 2005 annual meeting. Almost every weekend, for most of the year, Alex puts on his signature yellow t-shirt, heads to a road race on the Island, and runs for autism. As his shirt says, he runs for autism, not against autism. Not to raise money to find a way to cure himself or his brother or his mom or prevent people like himself from ever being born, but just to raise awareness and acceptance. He's doing it. Alex was also successful in raising over $550. in the Canadian Breast Cancer Foundation Run for the Cure. He crossed the finish line 9th out of the hundreds of runners in Charlottetown. By facing, accommodating, tackling, and conquering many challenges and obstacles, Alex has inspired many and has proven himself to be a most worthy recipient of the Ewen Stewart Inspirational Runner Award. Alex -- would you please come forward to accept your award. Alex's Acceptance Speech Wow! This is unbelievable. and my father Roger. And my grandfather who died a couple of years ago, that's Roger's father Ralph. Roger Bain married janet and we live in Oyster Bed Bridge. To my (fellow Bluefield) student, Tyler Seller, who joins in every race. And they're showing a picture of the spectacular race in 25K in Kensington, using my water pack, my Camel Bak, and against all odds. I ran on the Confederation Bridge. high marks in Math, Industrial Arts (it wasn't IA it was Communications) and English. and I'm a very lucky boy for being Inspirational Runner Award.